NILE KINNICK 5024 HAMILTON OMAHA, NEBRASKA October 31, 1938 Mr. James W. Fay Emmetsburg, Iowa Dear Mr. Fay: The Iowa-Purdue game, while not a win by the scoreboard, was a distinct satisfaction in that Iowa played a really fine game of football and I wish to add my note to the many that you must be receiving in appreciation of your part in helping those boys find themselves. 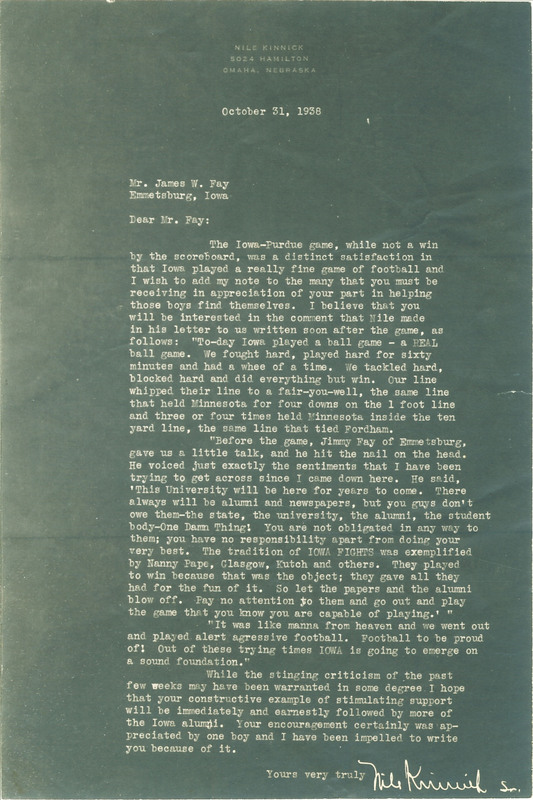 I believe that you will be interested in the comment that Nile made in his letter to us written soon after the game, as follows: "To-day Iowa played a ball game - a REAL ball game. We fought hard, played hard for sixty minutes and had a whee of a time. We tackled hard, blocked hard and did everything but win. Our line whipped their line to a fair-you-well, the same line that held Minnesota for four downs on the 1 foot line and three or four times held Minnesota inside the ten yard line, the same line that tied Fordham. "Before the game, Jimmy Fay of Emmetsburg, gave us a little talk, and he hit the nail on the head. He voiced just exactly the sentiments that I have been trying to get across since I came down here. He said, 'This University will be here for years to come. There always will be alumni and newspapers, but you guys don't owe them-the state, the university, the alumni, the student body-One Damn Thing! You are not obligated in any way to them; you have no responsibility apart from doing your very best. The tradition of IOWA FIGHTS was exemplified by Nanny Pape, Glasgow, Kutch and others. They played to win because that was the object; they gave all they had for the fun of it. So let the papers and the alumni blow off. Pay no attention to them and go out and play the game that you know you are capable of playing.' " "It was like manna from heaven and we went out and played alert agressive football. Football to be proud of! Out of these trying times IOWA is going to emerge on a sound foundation." While the stinging criticism of the past few weeks may have been warranted in some degree I hope that your constructive example of stimulating support will be immediately and earnestly followed by more of the Iowa alumni. Your encouragement certainly was appreciated by one boy and I have been impelled to write you because of it. Yours very truly Nile Kinnick Sr.